Image caption The council described Henry's death as a "very sad incident"
Henry, a four-year-old Golden Guernsey goat, died on Wednesday following liver complications after being overfed bread at Middlesbrough's Stewart Park. 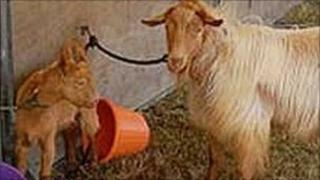 Middlesbrough council said the goat had been ill since September and had had extensive treatment from a vet. It said animals were fed the "correct diet" by zoo staff and did not need extra food from visitors. Councillor Paul Thompson, executive member for Streetscene services, said: "This is a very sad incident. "We ask visitors not to feed bread and cakes to the animals in the pens, and there are notices in the pens advising the public of this. "In the current cold and snowy winter some people may feel they want to feed the animals, but please don't. "The park animals can cope with the weather and are fed the correct diet at the correct times by our trained staff. "Unfortunately this incident shows that visitors bringing food for the animals can easily have fatal consequences."